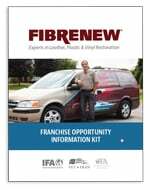 Saul Shapiro was a materials engineer and a broadcast technologist before he opened his own leather, plastic and vinyl restoration franchise business with Fibrenew. Shapiro’s story is unique because while most of his fellow franchisees operate their businesses from vans and trucks, Saul’s mode of transportation for his on-site service business is a bicycle and trailer. In this 3:40 video, we follow Saul on his bike to a leather repair job in a customer’s home on Manhattan’s upper west side.